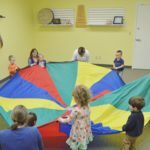 This month, I’m incorporating stretchy bands, drums, and bells, along with plenty of opportunities for fine and gross motor movement, discrimination of loud and soft, identification and awareness of emotions, group cohesion, and much more. The February session plan includes 10 goal-based songs (mp3, instrumental track, lyrics/chords) along with a facilitation guide for each song, which will allow you to implement a cohesive 30-45 minute music experience. Grab it for yourself for just $10, or save even more by subscribing for an entire year.